Hi all, and welcome back to the blog! As of recently I've been really into thrifting. Now thrifting and visiting flea markets has been something that I've done since I was a kid. I remember growing up, my mom would always take me and my sister to our local swap meet and antique shops whenever we had breaks from school and we loved it! While my taste in stuff has changed then, my process of thrifting has pretty much remained the same over the years. This blog post is dedicated to the art of thrifting: my favorite places to thrift, things I'm always on the hunt for, and things to remember when thrifting. So if you're new to thrifting or consider yourself a pro enjoy this mini guide to thrifting! This one is definitely my favorite! 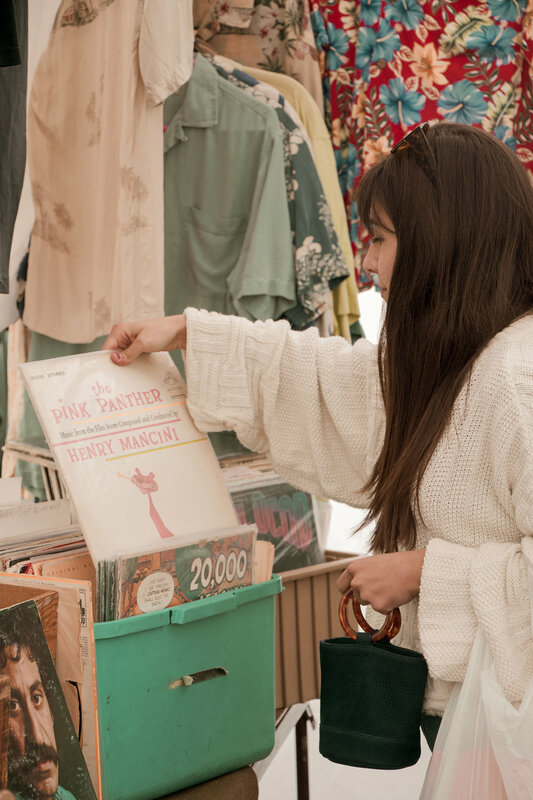 The Rosebowl Flea Market only happens on the second Sunday of the month, rain or shine and because of that it is huge! If you want to see all of it, definitely dedicate your whole Sunday morning/early afternoon to doing so. Admission is $9 which is not terrible considering how many vendors they have. Unlike the Rosebowl Flea Market, this one happens every Sunday on the campus of Fairfax High School. Admission is only $3 and it is not nearly as big as the Rosebowl making it a good place to visit for those who are new to thrifting. You can find this antique mall right in the heart of Old Town Orange and it isn't the only antique store there, but it is my favorite. This is one of the biggest antique stores I've ever been to, having both an upstairs and a downstairs of aisles and aisles of vintage finds. Located in Newhall this shop is super cute, featuring a lot of country charm pieces for the home. They specialize in repurposed furniture and home accessories but also sell some newer merchandise! It's a small but very charming antique store that I love to visit whenever I get the chance. When I am thrifting there are a few things that I am always on the hunt for. These things are: vintage Disney merchandise (anything from old postcards, to pins, to T-shirts), unique graphic tees, records (especially Disney, Beatles, Fleetwood Mac or old time jazz records), and vintage books. Sometimes I get really lucky and hit the jackpot and other times I walk away with nothing. But that's the fun part about thrifting - you never know what you're going to find. For those who are new to the thrifting game there are some important things to remember. Do some research beforehand. I always like to checkout the shop's Yelp page before visiting to see what other customers thought of the place and to read if it truly is an antique store or more of a store that just resells newer items. Don't be afraid to haggle down the price. It might be a little scary at first because nobody likes being told no, but the vendors at flea markets are usually very nice and understanding and more often than not they're willing to because they want to make the money. While that pile of what looks like junk could very well be just that, keep in mind that you never know what could be hiding under there! I always make sure to do a quick scan over everything because there have been so many times I've found a true gem hiding beneath all that "junk."